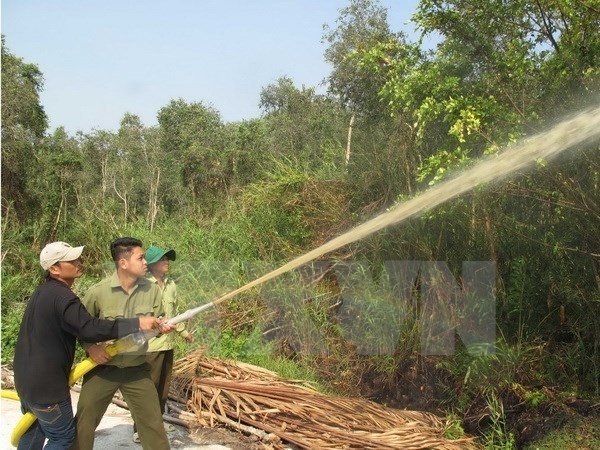 Prolonged dry weather has significantly increased the risk of forest fires in the southernmost province of Ca Mau, the provincial Forest Protection Department reported. A forest fire training session at U Minh Ha National Park in Ca Mau Province. More than 11,000ha of nearly 45,000ha of forest cover affected by the hot weather is facing dangerous and extremely dangerous conditions, Le Van Hai, head of the department, said on Wednesday. Provincial and district forest protection departments have also been asked to work with local authorities to regularly inspect, patrol and strictly manage forest areas to timely detect violations related to forest protection and development.